Clicking the button will save the visitor's email in the Visitors section of your Workspace. 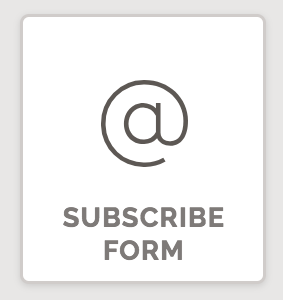 Use the subscribe component to build up a list of emails, where you aren't concerned with acquiring other information from a visitor. Subscribe Theme - change a subscribe component's theme. You can choose one of the two themes: outline, standard (default). A newly added subscribe component shares its theme with other already added subscribe components. Uncheck "Use Shared Theme" to make this subscribe component's theme unique. Placeholder - text to display in an empty form field. By default, it is set to "Enter your email". Subscribe Styles - change a subscribe button's color, size, shape. The available colors are determined by your page theme's color palette. You can choose one of the three sizes: small, medium, large. You can choose one of the three shapes: square, rounded, pill.